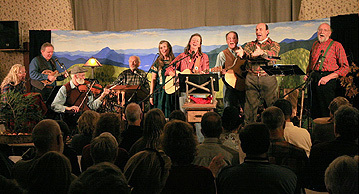 Old Songs, Inc. presents a new production called The Visitors— the history, music and songs of the Adirondacks. Featured performers are Dan Berggren, Peggy Lynn, Joseph Bruchac, John Kirk, Trish Miller, George Ward, George Wilson, Toby Stover and Bill Spence. Songs, music and poetry are woven into a narrative illuminating the past, present and future of life in the Adirondacks. Cast members raised in the Adirondacks share personal stories of their ancestry, with strong harmony singing, participatory choruses and thrilling solo work, making this concert both unusual and memorable. The production in two acts was conceived by Old Songs Director Andy Spence. Peggy Lynn, singer, songwriter and arts educator, possesses a sultry, yet powerful, alto voice. In her work and music, Peggy brings to light the important role women have played in shaping the history of New York State. A lifelong collector and performer of traditional songs, George Ward draws on the rural singing tradition of the American Northeast for his main inspiration. Ancient ballads migrant in the New World, songs of the rural home and hearth, songs of the lumber woods, the rivers and canals are central to his repertoire. Author and storyteller Joseph Bruchac has family roots in the Abenaki peoples and was raised, and still lives, in the Adirondack mountain foothills. Much of his writing draws on that land and his Abenaki ancestry. He has authored more than 70 books for adults and children. As a professional teller of the traditional tales of the Adirondacks and the Native peoples of the Northeastern Woodlands, Joe Bruchac has performed widely in Europe and throughout the United States. John Kirk & Trish Miller are a married couple from the foothills of the Adirondacks. They work together full time, playing music and singing in concerts, festivals, schools, and both call dances. Highlights of their performances include John’s fiddling and Trish’s dynamic clog dancing. George Wilson and Toby Stover have been a mainstay in the Northeast contra dance scene for over 35 years. Spence was among the first to champion the hammered dulcimer as it began its revival in the early ’70s. George Wilson is a talented multi-instrumentalist and singer whose repertoire samples a wide variety of traditional styles. Toby Stover is a long time veteran of the music and theatre arts, having worked extensively with a wide range of groups and programs. She has arranged the overture for The Visitors featuring the piano and fiddle. Entrepreneur and producer for over thirty years in the field of folk and traditional music. 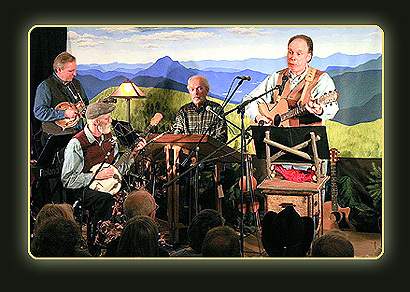 A founding member of the Pick'n and Sing'n Gather'n and Old Songs, Inc. Andy's producing credits include Woody Guthrie's California To The New York Island (1969), A Tribute to Malvina Reynolds (1972), An Evening At the English Music Hall (1974), The Old Songs Festival of Traditional Music and Dance (since 1981) and The American Conscience: Folk Songs of the 1960s (2004). Dedicated to presenting folk, traditional, Celtic and World music and dance in the Capital District, she continues to carry on the tradition. Includes all songs and music with selected narration. Ron Seelig makes beautiful Adirondack style frames. 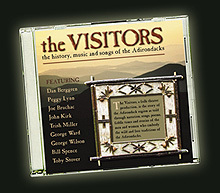 We used the frame pictured here on the cover of The Visitors CD. Click on the link above or the photo to check out and purchase his work. AdirondackMusic.org - Great new site with a wealth of information on the musical history of the Adirondacks.